The number of Internet users in India is expected to reach 402 million by December 2015, registering a growth of 49% over last year, according to a report ‘Internet in India 2015’, jointly published by the Internet and Mobile Association of India (IAMAI) and IMRB International, today. While Internet in India took more than a decade to move from 10 million to 100 million and 3 years from 100 to 200 million, it took only a year to move from 300 to 400 million users. 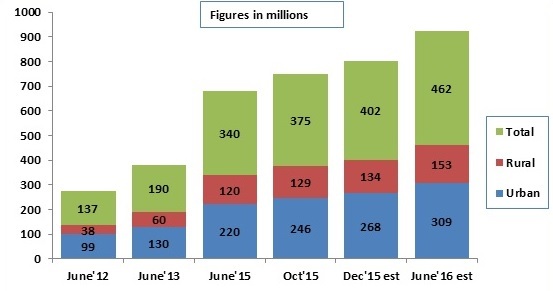 In October 2015, there were 375 million internet users in India. Monthly active internet users in October 2015: 317 million (209 million in Urban India), expected to reach 426 million by June 2016. By December 2015, India will overtake the US as the second largest Internet users’ base in the world. China currently leads with more than 600 million internet users. 71% male and 29% female are Internet users in India. The Internet usage among males has been growing at a rate of 50% while it is growing at 46% for female users. Among the female Internet users, the highest growth has been among the Non-Working women. This segment has grown by 97% over last year. As on October 2015, 69% of Users are using Internet on a daily basis. This daily user base has gone up by 60% from last year. As on October 2015, Mobile Internet had a penetration of 21% in India with 276 Mn users. 2/3rds of Internet non-users intend to use the internet through mobile phones. 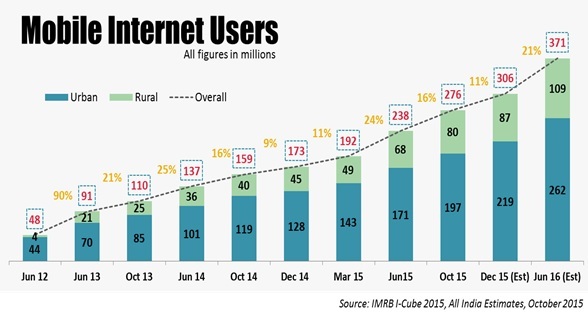 Major driver for the increase in the internet users is the outburst of smartphone users in rural India. With the mobile penetration growing we can expect the consumption of language based sites (content, commerce, services) to only grow exponentially. Before we see the inflection point it would be good for all government service based sites (income tax, health, education etc) to be made mobile web friendly and also made available in all major Indian languages. If not, the new mobile internet users may find their digital journey to be disappointing.